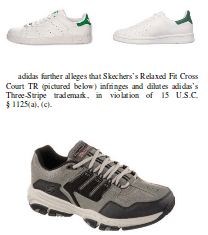 Skechers's own conduct also supports the district court's finding. "[P]roof of copying strongly supports an inference of secondary mea­ning." Vision Sports Inc. v. Melville Corp., 888 F.2d 609, 615 (9th Cir. 1989). Skechers placed metadata tags on its website that di­rected con­sumers who searched for "adidas Stan Smith" to the page for the Onix shoe. "Using another's trademark in one's metatags is much like posting a sign with another's trademark in front of one's store." Brookfield Commc'ns, Inc. v. W. Coast Entm't Corp., 174 F.3d 1036, 1064 (9th Cir. 1999). We agree with the district court that "the only reason 'adi­das Stan Smith' is a useful search term is that consumers associate the term with a distinctive and recognizable shoe made by adidas." Das einflussreiche Revisionsgericht erörterte danach lehrreich die Merkmale der Verwechslungsgefahr im Markenrecht mit zwei Mindermeinungen an­hand der markenrechtlichen Merkmale, die auf den Schutz der Warenaufmachung an­ge­wandt werden: "Likelihood of confusion in the trade dress context is eva­lu­a­ted by reference to the same factors used in the ordinary trademark context[:] strength of the trade dress, similarity between plaintiff's and defendant's trade dress, evi­den­ce of actual confusion, marketing channels used, type of goods and likely de­gree of purchaser care, and the defendant's intent in selecting its trade dress." Vision Sports, 888 F.2d at 616.